What is the role of international human rights in U.S. law? This essay first introduces two recent important decisions of the U.S. Supreme Court. Sosa v. Alvarez-Machain addresses customary international human rights law. Medellin v. Texas has to do with treaties. Taken together, Sosa and Medellin assign international human rights judgments only a modest role in U.S. law. This modest role is really not all that surprising. Unlike the many states that belong either to the European Court of Human Rights or the Inter-American Court of Human Rights, the United States belongs to neither. So the extensive jurisprudence one finds in so many other Western states relating to the relationship between national law and an international human rights tribunal simply does not exist for the United States. 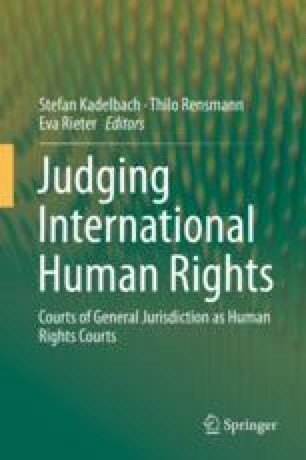 However, there is much more to say about the relationship of U.S. law to international law in general that does impact on international human rights, and this essay concludes with a review of this long tradition. With thanks to Alexa Millinger, UConn Law '14, for her help in proofreading and footnoting this essay.